BACKGROUND AND PURPOSE: Angioplasty and stenting of the IA have been reported with high technical and clinical success rates, low complication rates and good mid-term patency rates. Different antegrade or retrograde endovascular catheter-based approaches and combinations with surgical exposure of the CCA are used. The purpose of this study was to determine safety, efficacy and mid-term clinical and radiological outcome of the stent-assisted treatment of atherosclerotic stenotic disease of the IA with special focus on the different technical approaches. MATERIALS AND METHODS: Between 1996 and 2008, 18 patients (12 men, 6 women) with symptomatic high-grade stenosis (>80%) of the IA were treated with endovascular stent placement. Their mean age was 60.4 years (range, 48–78 years). Mean angiographic and clinical follow-up was 2.7 years (range, 0.3–9.1 years). Clinical follow-up was performed by using the mRS at hospital discharge, routine follow-up controls, and a questionnaire. In 11 patients, a percutaneous approach was used. In 7 patients, the lesions were accessed retrogradely through a cervical cut-down with common carotid arteriotomy. In 2 patients, a simultaneous ipsilateral carotid endarterectomy was performed. RESULTS: In all patients, primary stent placement was performed. There were 2 procedure-related transient complications (11.1%) due to cerebral embolism without permanent morbidity or mortality. During the follow-up, all patients showed improvement of the preprocedural symptoms. At the latest clinical follow-up (mean, 2.7 years), all patients showed an excellent or good outcome (mRS, 0 or 1). In 2 patients (11.1%), a secondary stent placement was needed due to a significant symptomatic in-stent stenosis. CONCLUSIONS: Percutaneous and open retrograde stenting of high-grade stenosis of the IA is a viable less invasive alternatives to open bypass surgery with good midterm clinical results and patency rates. Angioplasty and stent placement in symptomatic atherosclerotic stenoses of the supra-aortic vessels, including the IA, have evolved as effective and safe treatment techniques since the 1990s.1,2 Standard open surgical procedures are now mostly reserved for extensive multivessel involvement or after failed endovascular procedures. Indications for treatment include clinical symptoms ranging from transient ischemic attacks, stroke, subclavian steal syndrome, and vertebrobasilar insufficiency syndromes to upper limb ischemia. Treatment options include in situ or extra-anatomic bypass surgery, endarterectomy, or endovascular treatment, including balloon angioplasty and/or stent placement. Different antegrade or retrograde endovascular catheter-based approaches and combinations with surgical exposure of the CCA are used. For IA stenosis with concomitant disease of the carotid bifurcation, open retrograde angioplasty and stent placement with or without concomitant carotid endarterectomy have been advocated as less invasive treatment alternatives to the traditional surgical procedures.1,3–5 Often the IA represents the most challenging supra-aortic trunk vessel due to its large diameter and short length as well as the bifurcation pattern into the right CCA and SCA. Endovascular stent-placement interventions have been reported with high technical and clinical success rates, low complication rates, and good midterm patency rates.1,2,6–10 However, potential embolic complications during balloon inflation and stent deployment as well as restenosis remain an important concern. The purpose of this study was to determine the safety, efficacy, and midterm clinical and radiologic outcome of the stent-assisted treatment of atherosclerotic stenotic disease of the IA, with special focus on the different technical approaches. Between 1996 and 2008, percutaneous or open retrograde stent placement in the IA was performed in 18 patients (12 men, 6 women) from 48 to 78 years of age (mean, 60.4 years) with high-grade (>80%) symptomatic stenosis. Patients were selected for endovascular or combined surgical/endovascular treatment after discussion by an interdisciplinary neurovascular board consisting of attending neuroradiologists, neurologists, vascular surgeons, and angiologists. All interventions were part of routine clinical management. Patient data, technical and clinical success, complications of the procedure, and results of follow-up controls were reviewed retrospectively from the patients' charts and radiologic reports. The patients' characteristics, clinical symptoms, cardiovascular risk factors, and comorbidities are summarized in the Table. All patients underwent preinterventional clinical examination with bilateral arm pressure measurements and duplex sonography. As part of the preoperative work-up, patients underwent either MRA, CTA, or conventional DSA to confirm the suspected lesion. PTA and stent placement were performed with the patient under local anesthesia, whereas open retrograde stent placement with the patient under general anesthesia was performed in the angiography suite on a biplane high-resolution angiography system (CAS 500, Toshiba Medical Systems, Tokyo, Japan until 2007; Artis zee biplane, Siemens, Erlangen, Germany since 2008). Access to the lesion was gained through a percutaneous puncture of the common femoral artery in 13 patients, of the brachial artery in 1 patient with Leriche syndrome, and by using both accesses in 1 patient with a residual stenosis for postdilation of the stent in a second session. Retrograde access through surgical exposure of the right CCA was performed in 7 patients. Technical characteristics of the interventions are summarized in On-line Table 1. Using the antegrade femoral approach, we obtained angiographic images by using either a 5F diagnostic catheter proximal to the IA origin or a pigtail catheter placed in the ascending aorta to define the exact location and severity of the lesion. Then an 8F guiding catheter or a long 6F-7F sheath (SuperArrow -Flex PSI Set; Arrow International, Reading, Pennsylvania) was used, depending on operator preference, lesion location, and aortic arch configuration. For the brachial approach, a long 6F sheath was used. Guidewires measuring 0.018–0.035 inches were used, depending on operator choice. Whenever possible, the procedure was completed via the femoral approach because of better visualization and easier stent deployment. In patients with a combined brachial and femoral approach, the femoral catheter was placed in the aorta or in the proximal IA with its tip pointing to the stenotic site. Through the transbrachial approach, a 0.035-inch (260 cm long) guidewire (Radiofocus Guide Wire; Terumo, Tokyo, Japan) was navigated retrogradely into the descending aorta. Then by using a snare, the wire was lead through the femoral sheath, resulting in a wire through the whole body from the brachial to the femoral artery. This procedure allows the introduction of a smaller sheath for brachial access. Retrograde stent placement was then attempted from the brachial access by using a stiff hydrophilic guidewire. The hybrid approach by using an open and an endovascular technique with surgical exposure of the CCA with distal clamping to prevent cerebral embolization before retrograde stent deployment was used in 7 patients. Surgical access to the CCA was described previously.12,13 Briefly, a standard cervical approach to the carotid bifurcation by using an incision along the sternocleidomastoid muscle with the patient under general anesthesia was performed in the angiography suite. Retrograde puncture of the exposed CCA by using a 16-ga needle was followed by the insertion of a short 6F sheath. A roadmap of the target lesion was acquired either by using the transfemorally introduced diagnostic 5F guiding catheter placed with the tip in the prestenotic segment of the IA (5F, JB 2) or in the ascending aorta (pigtail). Clamping of the distal CCA to prevent cerebral embolization was then performed just before retrograde crossing of the lesion with a 0.035-inch guidewire as well as during stent deployment. Opening of the side branch of the CCA sheath allowed drainage of potential debris before restoration of the carotid flow by removing the clamp and flushing the CCA with a heparinized solution to avoid thrombus formation. The technical success of the treatment was controlled by antegrade and retrograde angiography. The arteriotomy was closed by using a 6–0 Prolene suture (Ethicon, Cincinnati, Ohio), and the clamp was removed. In 2 patients with concomitant high-grade stenoses of the internal carotid artery, a combined procedure consisting of carotid endarterectomy with a bovine pericardial patch reconstruction of the carotid bifurcation and subsequent retrograde stent placement in the IA was performed. Stent selection was based on vessel reference diameter and lesion length. Stainless balloon-expandable stents were preferred due to their better delivery profile and deployment precision. The stent diameter was chosen not to exceed the vessel reference diameter. Twenty lesions were treated, including 2 secondary procedures. Due to the long 12-year period of patient inclusion, we used various stents: Palmaz stent (Cordis Corporation, Miami Lakes, Florida) in 4, WaveMax (Jomed, Benningen, Switzerland) in 8, Jostent (Abbott Laboratories, Abbott Park, Illinois) in 1, Easy Wall stent (Boston Scientific, Galway, Ireland) in 1, Bridge stent (Medtronic AVE, Düsseldorf, Germany) in 2, Herculink stent (Abbott Laboratories) in 1, Invastent Onda (Invatec, Roncadelle, Italy) in 1, Omnilink stent (Abbott Laboratories) in 1, and Scuba (Invatec) in 1 lesion. The stent diameter varied from 7 to 12 mm, and the length, from 17 to 30 mm. After the interventional procedure, a final angiography was always performed to confirm the technical success and patency of the vessel. Technical success was defined as a stenosis grade reduction of >80% of the target vessel. In the percutaneously treated patients, no embolic protection device was used. Aspirin, 100 mg daily, was given for at least 5 days before the intended procedure and was continued afterward on a life-long basis. In 9 pa-tients, clopidogrel, 75 mg daily, was added for 6 months. During the procedure, 5000–6000 IU of heparin was administered. Clinical follow-up consisted of a history of recurrent or new onset of symptoms, physical examination including peripheral pulses, bilateral arm blood pressure measurement, and duplex sonography postinterventionally and at 3, 6, and 12 months. MRA or DSA was indicated if significant change in the duplex examination or relevant clinical symptoms occurred and if duplex sonography was not conclusive or if additional new or progressive occlusive lesions of the supra-aortic vessels were suspected. For midterm follow-up, we requested clinical examination, duplex sonography, and MRA for all patients. Clinical outcome was assessed by using the mRS at hospital discharge, routine follow-up controls, and a questionnaire for midterm follow-up. Stent deployment could be achieved in all patients (100%). Technical success was 94.4% (17/18). In 1 patient, the distal part of the stent was not completely apposite to the predilatated vessel wall. This outcome resulted in a 50%–75% residual stenosis. Balloon postdilation within the stent in a second session 2 days after the initial treatment resulted in complete apposition of the stent meshes at the vessel wall without residual stenosis (Fig 1). Case 1. A and B, Aortic arch DSA showing a high-grade stenosis of the IA in a 64-year-old patient and demonstrating a vertebrovertebral steal with retrograde flow in the right vertebral artery (arrows). C, Antegrade stent placement (Palmaz, 12 /3 cm) and balloon dilation of the stenosis. D, Control angiogram shows a residual stenosis at the proximal IA and slightly nonadherent stent meshes (arrow) in the distal part. With a transbrachial approach, a 0.035-inch-long (260 cm) guidewire (Terumo) was navigated retrogradely through the stent into the descending aorta. E, With a snare, the wire was lead through the femoral sheath, resulting in a wire through the whole body from the femoral to brachial artery. F, Introduction of a balloon catheter retrogradely through the brachial end of the wire and postdilation of the stenosis, resulting in no residual stenosis and completely adherent stent meshes. There were 2 cases (11.1%) of procedure-related transient complications due to cerebral embolism. In both patients, endovascular PTA/stent placement was performed without an embolic protection device: One patient had a transient left-hand weakness with a diffusion restriction depicted by cranial MR imaging in the right hand notch, which resolved after 24 hours. Postinterventionally, 1 patient had a neglect and a fluctuating left hemiparesis with complete recovery after 24 hours. Cranial MR imaging showed small embolic ischemic lesions in the right caudate nucleus and the precentral and occipital regions. In 2 patients, clinically silent diffusion restrictions could be detected by postinterventional MR imaging after PTA/stent placement. There were no embolic complications among the patients who underwent open retrograde stent placement. There was no procedure-related permanent morbidity or mortality. No access-related complication occurred. Follow-up varied between 0.3 and 9.1 years (mean, 2.7 years). At least 1 clinical and radiologic follow-up could be performed in all 18 patients. Immediate complete resolution or improvement of the vertebrobasilar steal syndromes (subclavian steal, upper limb ischemia, syncope/presyncope) could be achieved in all patients. In patients with asymmetry in arterial blood pressure in the upper limbs with a gradient exceeding 20 mm Hg, a normalization could be achieved. At the latest clinical follow-up, all patients showed an excellent or good clinical outcome according to an mRS score of 0 or 1. In 2 patients (11.1%), restenting due to a symptomatic restenosis of the lesion was needed. One patient had another transient monocular blindness 10 months after endovascular PTA/stent placement. Control duplex sonography showed a midgrade concentric restenosis of the proximal stent with an incomplete steal phenomenon. Annual follow-up was performed, and after 34 months, a progression to a high-grade stenosis was detected. The patient underwent endovascular restenting with a Jostent (Abbott Laboratories). One patient developed signs of upper limb ischemia and transient monocular blindness 10 months after open retrograde stent placement. A short high-grade proximal restenosis was found at follow-up sonography. The patient underwent restenting with a Palmaz stent (Cordis) (Fig 2). In all other patients, no significant restenosis was found at latest follow-up. Case 2. A, Aortic arch DSA through a pigtail catheter in the aortic arch introduced by a femoral approach in a 74-year-old patient with several TIAs and transient monocular blindness, depicting a long high-grade IA stenosis with irregularly configurated circumferential plaque. B, Retrograde introduction of an 8F sheath (arrow) and passing of the lesion by using a 0.035-inch guidewire (Terumo) guided by a roadmap of the aortic arch through the diagnostic pigtail catheter. C, Predilation of the lesion by using a balloon catheter and introduction and deployment of the balloon-mounted stent (Palmaz, 10/30 mm). D, Postinterventional control angiogram shows no residual stenosis and correctly placed stent meshes at the origin of the IA. E, One year after the treatment, the patient again had transient monocular blindness and a weakness of the right arm. F, Control angiography shows a high-grade restenosis of the proximal stent at the origin of the IA. G and H, Predilation of the stenosis by using a balloon catheter and restenting by using in-stent deployment of a Palmaz stent over a 9F guiding catheter. Symptomatic stenotic disease of the IA is uncommon compared with stenosis of other supra-aortic trunk vessels. Endovascular treatment of the IA is often challenging due to its large diameter, short length, and the proximity to the origin of the right CCA. Different approaches and methods have been described by various groups, ranging from minimally invasive percutaneous endovascular angioplasty and stent placement to open, hybrid, and combined approaches. However, the literature on the endovascular or hybrid open treatment of the IA is limited and consists only of small series with short clinical follow-ups.1,6–10 Furthermore, most of the series did not focus on the treatment of IA stenosis alone but combined the outcomes of the treatment of vertebral, subclavian, and carotid arteries.2,14–20 Therefore, to our knowledge, this series consisting of 18 consecutive patients, is so far one of the largest cohorts focused on stent placement procedures for high-grade IA stenosis available in the literature. In a meta-analysis performed by Hadjipetrou et al,2 evaluating the open surgical outcome in subclavian and brachiocephalic artery obstruction in >2000 patients, the mortality rate was 3%, the stroke rate was 2%, and the overall complication rate was 16%. 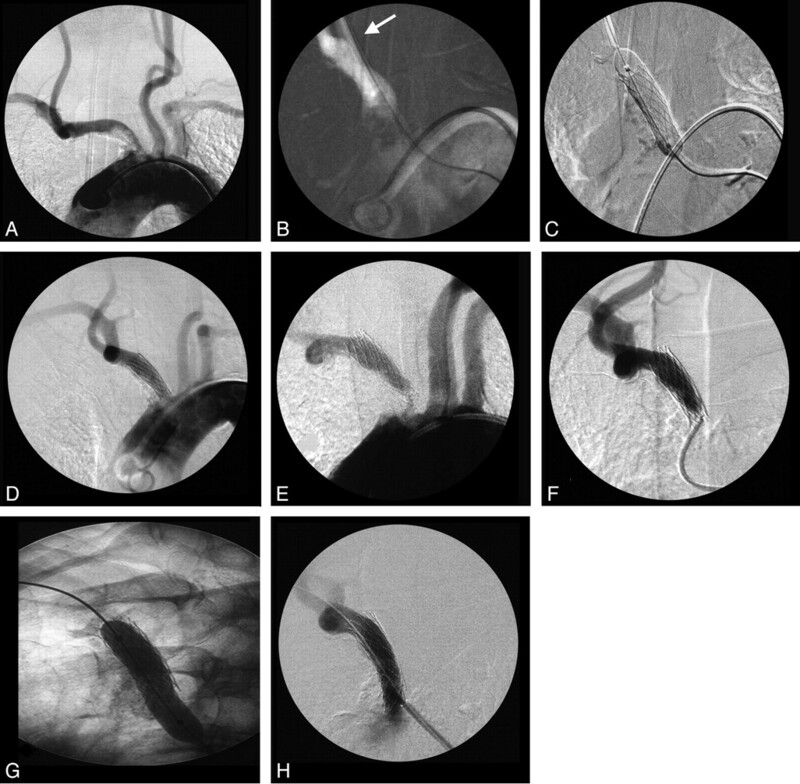 The 6 most recent studies about endovascular treatment of IA stenotic disease included 51 patients, with a maximum of 10 patients included in 2 studies.1,6–10 The authors reported technical success rates of 100%, no periprocedural mortality, only 1 case of a transient neurologic deficit, and 1 access-related complication consisting of a brachial artery thrombosis, which required thrombectomy. The patency rates ranged from 78% to 100% within 12–35 months of follow-up. Palchik et al10 compared the role of endovascular and open surgical approaches in the treatment of symptomatic IA stenosis in 18 patients, 10 patients in the endovascular and 8 patients in the surgical group. There were no thromboembolic events except 1 access-related complication (1/10) in the endovascular group and 2 systemic pulmonary complications in the surgical group (2/8). Patency rates were 78% in the endovascular group after 25 months and 80% in the surgical group after 27 months' follow-up. Restenosis occurred in 1 patient after 34 months in the endovascular group and in 1 patient in the surgical group; 1 additional patient had an asymptomatic bypass graft thrombosis. 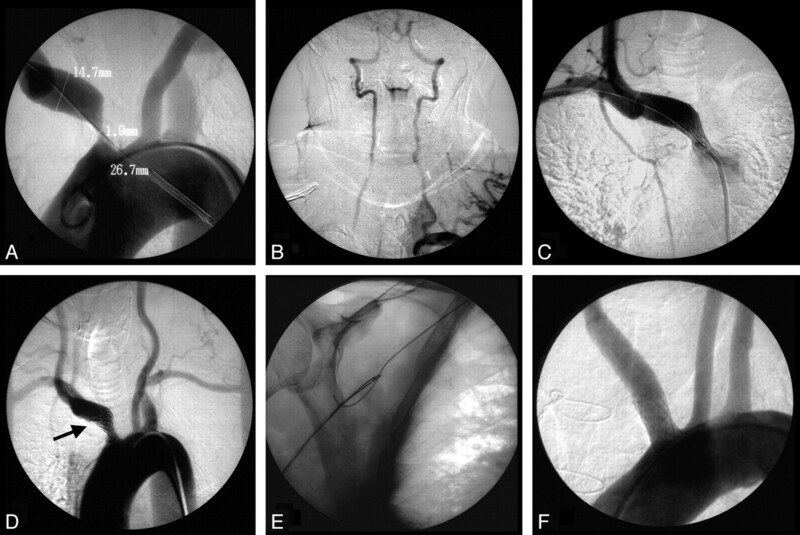 Hybrid, open, and combined endovascular techniques with exposure of the CCA with distal clamping to prevent distal embolization before retrograde stent deployment were described by Queral and Criado in 1996,1 with no patients having perioperative strokes. Recognizing the importance of cerebral protection against thromboembolic events, Peterson et al8 reported their experience in aortic arch vessel stent placement, including 8 IA stenoses by using cerebral protection by either open surgical distal CCA clamping or endovascular protection devices without mortality or complications. In 1 case of IA stenosis, cerebral protection was not possible due to a brachial approach. Payne et al5 reported no new neurologic deficits in their study of cerebral protection during open retrograde angioplasty/stent placement of 4 IA lesions, including a synchronous carotid endarterectomy in 1 case. During the angioplasty and a stent placement procedure, no emboli were detected in the ipsilateral middle cerebral artery territory by using transcranial Doppler monitoring. In our series, there were 2 transient neurologic deficits in the endovascular group (2/11), without a permanent neurologic deficit. In 2 patients, clinically silent ischemic lesions could be found by postinterventional DWI examination. Therefore, thromboembolic complications may be a concern, especially in highly calcified or more extensive lesions. In the open retrograde group, there was no periprocedural neurologic deficit, indicating that distal clamping of the CCA is an effective protection against procedural embolic events. On the other hand, there were no access-related complications, underlining the minimally invasive character of the interventions. Our strategy of treating IA lesions is mainly based on the following points: degree of stenosis, amount of calcified plaques at the ostium and at the site of stenosis, and IA branching with respect to the anatomy of the aortic arch. Selective catheterization of the IA is challenging in cases with branching of the IA from the aortic arch in a steep angle (eg, bovine type 3 configuration of the aortic arch), a high load of arteriosclerotic plaques at the ostium of the IA, and in high-grade near-occlusive lesions. These circumstances may require repetitive catheterization attempts from an unstable position of the transfemoral catheter in the aortic arch, increasing the risk of embolic events. In these cases, we learned that a retrograde transbrachial or open surgical approach combined with a femoral approach is useful and facilitates the procedure. Passing the lesion retrogradely with a wire is easier to perform because we avoid navigation over a long distance without much stability to pass a high-grade filiform stenosis. Capturing the wire in the descending aorta and leading it out through a femoral access allows a second step to stent the lesion less traumatically, either antegradely from the femoral approach or retrogradely through the brachial approach as described in patient 1. The resulting wire across the whole body from the brachial to femoral artery allows stretching of the angulated branching of the IA from the aortic arch and stretching of the angle of the stenotic segment in the direction of the SCA, leading to a more stable position for stent deployment. Therefore, in our view, the most important decision points in favor of a retrograde approach and against an exclusive antegrade femoral approach are the degree of aortic arch arteriosclerotic lesions around the ostium of the IA, the degree of stenosis, and a steep angulation of the IA from the aortic arch. Furthermore, in our experience, the use of a stent as short as possible without undersizing is paramount to avoid stent migration during deployment and to allow precise stent placement in relation to the ostium of the IA, avoiding stent extension into the aortic arch. The use of the utmost shortest stent length decreases the risk of kinking and fracture of the stent mesh as well as the risk of in-stent thrombosis and stenosis. However, precise placement of a short stent requires a stable situation, which can be obtained with a wire from the femoral to the brachial sheath, which can be stretched during deployment of the stent. In cases with high-grade tandem stenosis of the IA and the carotid bifurcation, it is sometimes difficult to define the symptomatic lesion or whether the possible additive effect of a tandem stenosis of the IA and the carotid artery on perfusion is an additional effect of both lesions, resulting in either embolic or hemodynamic symptoms. Simultaneous treatment of both lesions, consisting of a carotid endarterectomy combined with retrograde stent placement of the tandem lesion in the IA, has been described by various groups.3–5,21,22 Allie et al4 reported the combined treatment in 11 IA lesions, with a procedural success rate of 97%, and no significant restenosis found during a 34-month follow-up. Percutaneous endovascular and retrograde open stent placement in high-grade stenoses of the IA is a viable alternative to open bypass surgery, with good clinical results and high patency rates. Thromboembolic complications, even if silent, still remain a matter of concern, and embolic protection may be needed. Disclosures: Gerhard Schroth, Research Support (including provision of equipment or materials): University Hospital. Accepted after revision January 24, 2011.